"LADYGANG" Premieres Sunday, Oct. 28 on E! Friends that color-coordinate together, create amazing content together. Keltie Knight, Becca Tobin and Jac Vanek have us believing this is true as the three besties never miss a fashion moment while creating their celebrated LADYGANG podcast. Thankfully, fans will get to witness the trio's color-coordinated style on the small screen as E! 's LADYGANG TV series drops on Oct. 28. 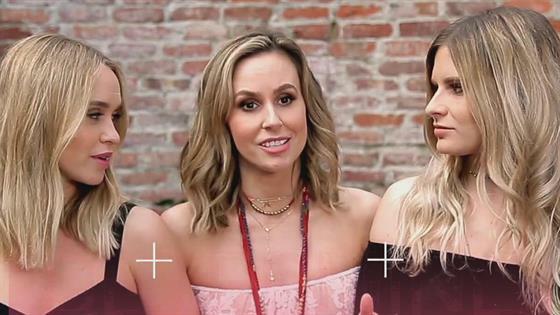 This means viewers will get a front row seat to Keltie, Becca and Jac's often perfect ensembles. Whether they're rocking LADYGANG merchandise or oozing coven vibes in all black, the industry vets refuse to miss a fashion beat…and we couldn't respect them more for it. Now, in case you haven't had the chance to do a deep dive on the LADYGANG's Instagram page, we've compiled the BFFs' best matching moments just for you. Be sure to see them all in the images below! Keltie, Becca and Jac simply shine in these sparkly numbers. The LADYGANG girls look like total ShEOs in black and tan. Move over, Sandy! We need a Grease remake with the LADYGANG. The LADYGANG oozes coven vibes thanks to their all-black ensembles. Nothing beats a theme, especially when a desert aesthetic comes into play! Keltie, Becca and Jac are the epitome of spring in these sundresses. Keltie, Becca and Jac rock denim for this casual shot. The LADYGANG ladies decide to match with striking jean jackets. The LADYGANG trio looks winter chic in these fashionable hats. The ladies perfect a girls' night in by donning matching robes! This makes us want to grab a mimosa and throw on a floral frock.